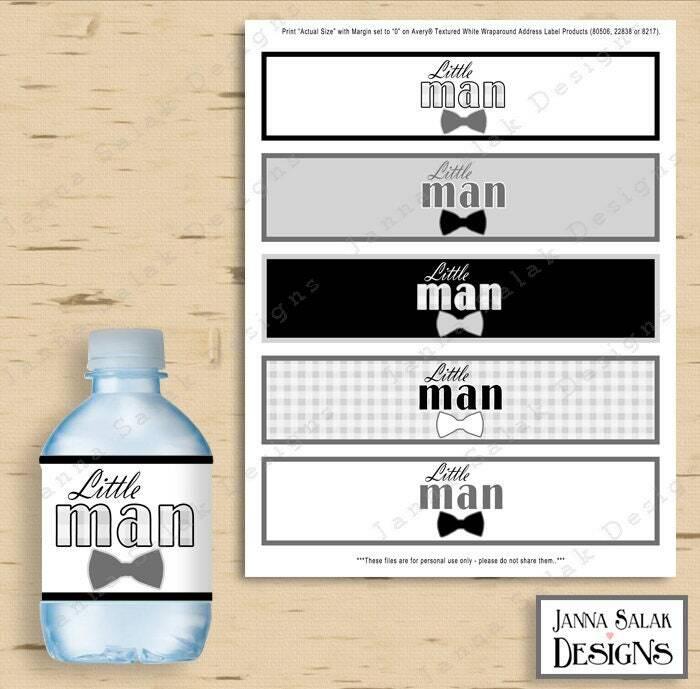 Little Man Baby Shower Printable Water Bottle Wrappers Labels. Perfect for a little man themed baby shower party! They've been designed to be used with the Avery® Textured White Wraparound Address Label Products (80506, 22838 or 8217). Or print on white cardstock or full page white sticker paper and trimmed to size with scissors or a paper cutter. 1. Add this design to your cart, check out, and make your payment via PayPal or direct checkout. 2. You will receive an email with a link to download your file or you can also access the download through your Etsy account. 3. Click on the link and download the file. * Open in Adobe Reader. * These labels were designed to be used with Avery® Textured White Wraparound Address Label Products (80506, 22838 or 8217). They can also be printed on white card stock or on full page sticker paper (US Letter, 8.5" x 11"), and trimmed to size with scissors or a paper cutter. * Colors may vary slightly from appearance on computer screen. Each monitor displays colors slightly different and not every printer will print colors the same. REFUND POLICY: Due to the digital nature of our products, no refunds or exchanges will be given. Great invite for our annual Super Bowl Party!! Due to the digital nature of our products, refunds or exchanges will only be given if the item has not been downloaded.